The coalition has managed to fall over the line in the New South Wales election and retain its hold on government. A factor in this was the state Labor Party leader Michael Daley being stuck with a racist label. He had said that “Asians with PhDs,” were moving in to take jobs from locals. It became a big media story during the end of the election campaign. He was forced to publicly apologise, and it hurt the Labor brand. the Coalition’s strategy was to demonise the Labor leader through as media blitz. A mishandling of the Allianz Stadium controversy was taken full advantage of. It got some traction. Somehow, Labor came out looking like the party against government projects that are of benefit to the people of New South Wales. This was only possible, because of the failure to convince the population that the opposite is true. Daley now faces an internal revolt against his leadership . But the Daley factor is not likely to have been enough on its own to prevent a Labor victory. Despite everything, Labor still had more people voting for than than the Liberals, who lost about 2.6 percent of votes overall. Labor only lost 1.1 percent. The reality is that the Coalition won with a direct vote of only 33.7 percent. Labor had 27.9 percent. This shows that more than one third of the electorate finds some problem with both. Thanks to the peculiar form of preferential voting in this state, the Coalition is able to retain its hold on government. The system of optional preferential voting advantages the the first place holder and makes it harder for the second runner to garner preferences. While there is a question mark on the democratic credentials of the preferential voting system, the one in NSW is worse than those in the other states. The Greens did better than many of the pundits had predicted and held their three seats. But it was the Shooters, Fishers and Farmers Party that soaked up the discontent, mainly taking from the National Party, showing that many in the country are sick and tired what they see, as an ongoing betrayal of their interests, by those who claim to be their leaders. One nation held its position for the same reason. Support for independents increased across the state, to form the most important change in the voting pattern. Like in the rest of Australia, voter discontent has been building for some time. As the drought hit, the discontent increased. Failure of the government to respond adequately is what hut the Nationals. Labor did not get any brownie points on this issue either. The reality is not that the Liberal Party did well. It hung onto government by not doing quite as badly as the other mob. 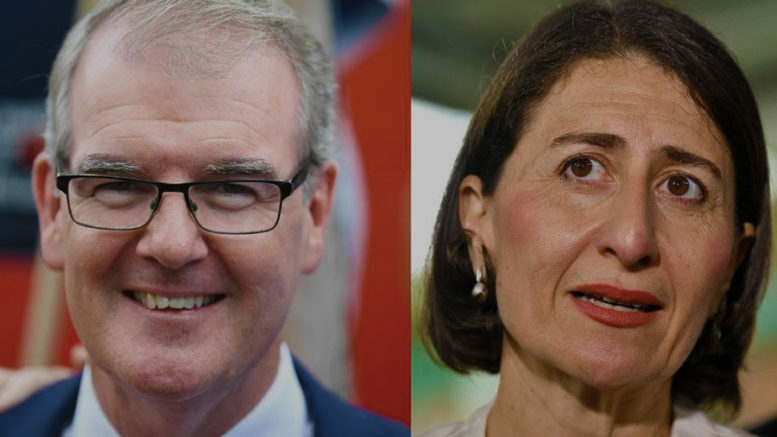 A shift away from the two traditional major parties is taking its own form in NSW. Labor must come to terms with this, and realise that it must be a real and convincing alternative that captures the mood of discontent and offers real solutions to existing problems. Otherwise, it will not generate the passion that will pull it forward. Australia needs a new political direction. One which articulates economic and social policies, which will unite society as a community working together for our collective future, and are not afraid to take on those who are holding us back, by maintaining the privilege for a few, at the expense of everyone else. NSW is part of this. For the Liberal Party, this is no time to celebrate, because the writing is still on the wall, and it does not look good in the longer term in NSW, nor for the coming federal election. Hanging on in this instance, does not mean support for Liberal Party policies. If there was this support, so many would not have turned elsewhere. Unless this changes, and his is not likely to, there will be a day of reckoning. 1 Comment on "Liberal win in NSW cannot hide that more voters are fed up with what is on offer"